Adeline is a gender and development consultant, and a bronze medal winner for the first ever “Create and Cook with Tooke Flour” competition. Adeline’s passion is to inspire individuals, especially women and youths, to discover their purpose, restore their dignity and creatively use their potential for a fulfilling livelihood. She is a trainer for AWARD and GREAT and previously worked with ASARECA, a regional organization represented by 11 member countries. 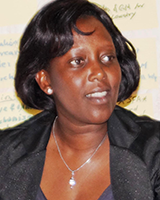 Prior to this, Adeline worked as a development practitioner with USAID, IFAD, Chemonics Inc, ILO and Winrock projects. She currently serves as a chairperson of a professional NGO, AUPWAE.